Artist Talk: September 15 from 2:00-3:30pm at the Watsonville Civic Plaza Community Room with Susana Arias, Amy Díaz-Infante, Dionicio Mendoza and Juan R. Fuentes. Curators’ Tour: September 16 from 2:00 – 3:00pm at Pajaro Valley Arts Gallery with Juan R. Fuentes and Michelle P. Mouton. 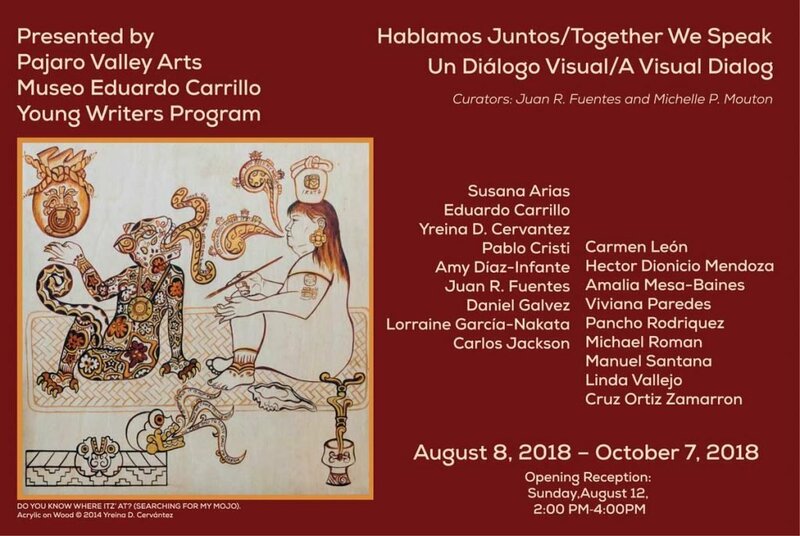 Curated by Juan R. Fuentes and Michelle P. Mouton, Hablamos Juntos explores visual dialogs created by prominent California Latinx artists at the Pajaro Valley Arts gallery in Watsonville. In this extraordinarily rich exhibit, you will experience how our artists give voice to and navigate: daily life, current events, social, political and cultural issues, community, ethnicity, as well as personal narratives, myths, and history. Click here for a virtual tour. Visit our Facebook page for additional photos. A collaboration between Pajaro Valley Arts, Museo Eduardo Carrillo, and the Young Writers Program, this project is supported in part by an award from the National Endowment for the Arts.